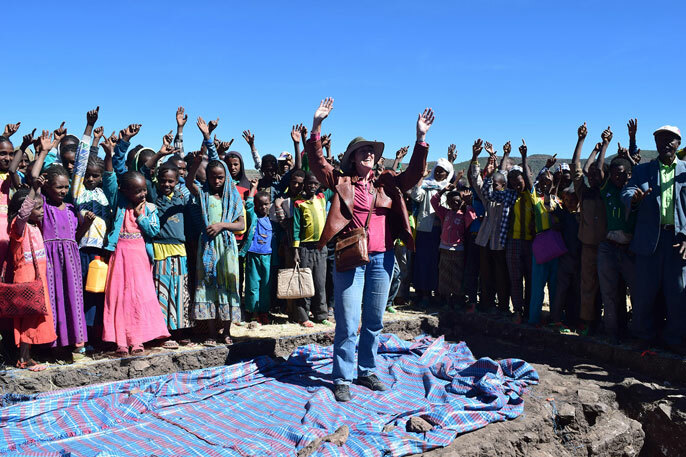 UCLA professor Willeke Wendrich joins with school children in chanting their enthusiasm for preserving the integrity of ruins near their village in northern Ethiopia. Near the small village of Mai Adrasha in Ethiopia, UCLA archaeologists found themselves digging into more than dirt. They were also diving into another role, serving as ambassadors of history to help the local community understand that there is wealth not only in the natural gold-rich soil that encloses long-buried ancient ruins, but also in preservation of cultural heritage. Tigray region in Northern Ethiopia. “We decided it was really worthwhile to keep this site so we spent a lot of time this season talking to people who live around Mai Adrasha,” said Willeke Wendrich, director of the Cotsen Institute and professor of Egyptian archaeology and digital humanities, who has led digs in the area for the last two years. The results of their efforts were heartening — for archaeology as a whole and for the UCLA team in particular. Wendrich, her co-director and graduate student Rachel Moy and their team recently returned from their second excavation near Mai Adrasha, in the region of northern Ethiopia called Shire. With several active trenches, they are looking for evidence from the pre-Aksumite era (before 300 B.C. ), a period that remains something of an archaeological mystery, partially because the remains of it are disappearing as a result of humans hunting for gold. A dig site near the small village of Mai Adrasha in northern Ethiopia where UCLA archaeologists have been conducting field research. Mai Adrasha, like most villages in the region, is impoverished. Locals, as well as people from equally poor villages farther away, have dug into the earth, panning for the tiny flakes of gold that can be found in the soil. In the process, they have dismantled much of what in other parts of Ethiopia has been preserved as attractive tourist destinations. In places like Aksum, one of the oldest continuously inhabited places in Africa, well-preserved, excavated walls and artifacts illuminate the ancient past and contribute to the local economy. After two digging seasons, encouraged by bits of metalwork and ceramic and other findings, the UCLA team wanted to keep their trenches as intact as possible. They reached out to the local community to help residents — and potential gold diggers — understand what exactly these foreigners are working toward. Wendrich and her team hosted a town meeting with the help of an interpreter who speaks the local Tigrinya (one of 52 languages spoken in Ethiopia) plus a borrowed generator — the town has no electricity. During the meting they were able to show photographs and diagrams that told the story of what the town had already lost because of the rampant gold digging. Villagers listened and then began shouting animatedly. Wendrich originally thought her plan had backfired. An important part of Wendrich’s community outreach also involved the youngest community members; she visited the two primary schools to talk to them about the dig. When one of the students asked if she could get them some chairs — the school had none — she made a donation to that cause in UCLA’s name. In the Shire region of northern Ethiopia, UCLA professor Willeke Wendrich and her team of archaeologists enlist members of the local community to help preserve cultural heritage. Across town at the other school Wendrich unearthed another treasure, a budding science program dubbed the NASA Scientific Laboratory. The school has next to nothing in the way of equipment, but the teachers are doing a remarkable job teaching the students scientific ideas, she said. Wendrich returned from Ethiopia with a detailed proposal from the school, carefully outlining everything they need and why. Willeke Wendrich knew she needed community buy-in to make archaeo-tourism a more attractive option than digging for gold. Much is known about Ethiopia’s Aksumite era, which spans from approximately A.D. 100 to 650, when northern Ethiopia was ruled by powerful kings and became a major player in the commercial route between the Roman Empire and ancient India. But archaeologists are eager to unearth artifacts that tell the stories of the culture and lifestyles of the people who lived in the many centuries before the Aksumite era. The UCLA team is currently the only group focusing on Shire. There are several other teams working in locations to the east of Aksum, but UCLA is the only team digging to the west of it. Wendrich and her team are analyzing samples from the dig, carefully dating everything and hope to announce exciting news in the next several months. They will return to Mai Adrasha in the fall. In the meantime, the trenches themselves are covered with tarps, then the excavations are re-filled with dirt so local farmers can continue to use their fields for growing crops. Anything the teams pull from the ground remains in regional offices in Ethiopia. UCLA archaeologists travel back home with a small box of samples for lab testing.